(Hong Kong - 4 February 2015) GreenRoam Limited, member of Taisys Technologies Co. Ltd, today announced that slimduet® SIM and slimduet® app, over-the-air (OTA) download services, will be premiered in Hong Kong. Mr. Jason Ho, Founder and CEO of Taisys Technology Limited and Mr. Moter Du, CEO of GreenRoam presented the new product and shared Taisys’ latest market developments during the launch. Tourists’ need in Internet access and mobile phone usage abroad grows gradually with the sustainable development of global tourism. Packed with Taisys’ exclusive innovative technology, SIMoME, slimduet® SIM untangles the inconveniences and provides cost and time-reducing solution for travellers and business visitors in communicating with local telecommunications operators and Internet service providers. slimduet® app allows travelers to purchase prepaid mobile services from a range of telecommunications operators in destination country prior to travel, mobile phone numbers are downloaded through OTA services and customer’s mobile device is automatically connected to the local telecommunication services upon arrival. Compared to traditional mobile phone services, the hassle of switching SIM cards and costly data roaming can be prevented simply by attaching slimduet®SIM to the existing SIM card. GreenRoam announced in December 2014 that China Mobile Hong Kong Co. Ltd (CMHK) have entered an agreement with them to become the first mobile network operator globally supplying prepaid SIM products to GreenRoam through OTA provision of soft SIM to consumers. Slimduet® app is now covering various popular travel destinations including United States, United Kingdom, Thailand, Hong Kong, Japan, Korea and Taiwan. Mr. Jason Ho said, “Taisys aims to offer travelers worldwide with the best telecommunications services. We will continue to approach and invite other global mobile network operators to join the slimduet® soft-SIM OTA download services, and we will further announce other service regions in near future.” Taisys hopes that travelers will be able to stay contact with their friends and families anywhere anytime with the most convenient and cost effective solution, and to enjoy the genuine communication experience without restrictions. Besides, Mr. Jason Ho also revealed the development plan of Taisys and announced the partnership with Hutchison Telecom Hong Kong Limited. According to Mr. Ho, the new service will be launched at the end of the first quarter of 2015, and more information will be announced in near future. Taisys Technologies Co. Ltd., an official member of GSMA, who founded in 2005 is a world leader in making mobile interconnectivity and vertical integration across various industry players more flexible, simple, secure, and reliable. 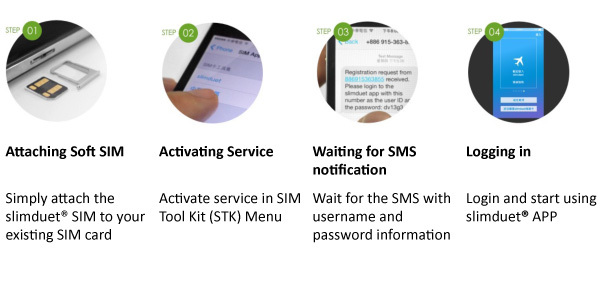 The patented SIMoME technology (Slim SIM) decouples Value-Added Services from the main SIM, empowering financial institutions, transport operators, and MNOs/MVNOs with innovative solutions (duoSIM, SmartDialer, mBanking, mobiOTP ,Secure eSMS, NFC duoPASS mPayment…). The slim SIM also serves as a Security Element securely storing 3DES, AES, PKI encryption Keys owned and managed by the card issuer. Over 10 million satisfied end users enjoy these mobile based value-added services worldwide. Present in Taipei, Beijing, Singapore, Thailand and South Africa, Taisys has consistently experienced significant growth powered by increasing demand for roaming and banking services. GreenRoam, a Hong Kong MVNO founded by Taisys in 2013, helps travelers enjoy Local Mobile Services on Demand by attaching a slim SIM onto their SIM cards and downloading prepaid packages from the GreenRoam Soft SIM Store. GreenRoam Limtied was founded in 2013. It’s innovative slimduet® the world’s first app for soft SIM OTA download services, has made the “Pay Local, Play Global” dream of international travelers a reality. Users of the app can purchase and download prepaid mobile service package offered by mobile network operators of different countries directly through the slimduet® store. Its parent company, Taisys Technologies Co. Ltd. (Taisys), holds quite a few patents and uses its core patented technology of SIMoME to equip the slim SIM with diversified value-added services to provide customers with the solution of vertical integration between telecommunication and mobile bank. Over 10 million satisfied end users have enjoyed these mobile based value-added services worldwide. An official member of GSMA and an ISO 27001 certified firm, Taisys is currently present in Taiwan, China, Singapore, Thailand and South Africa.